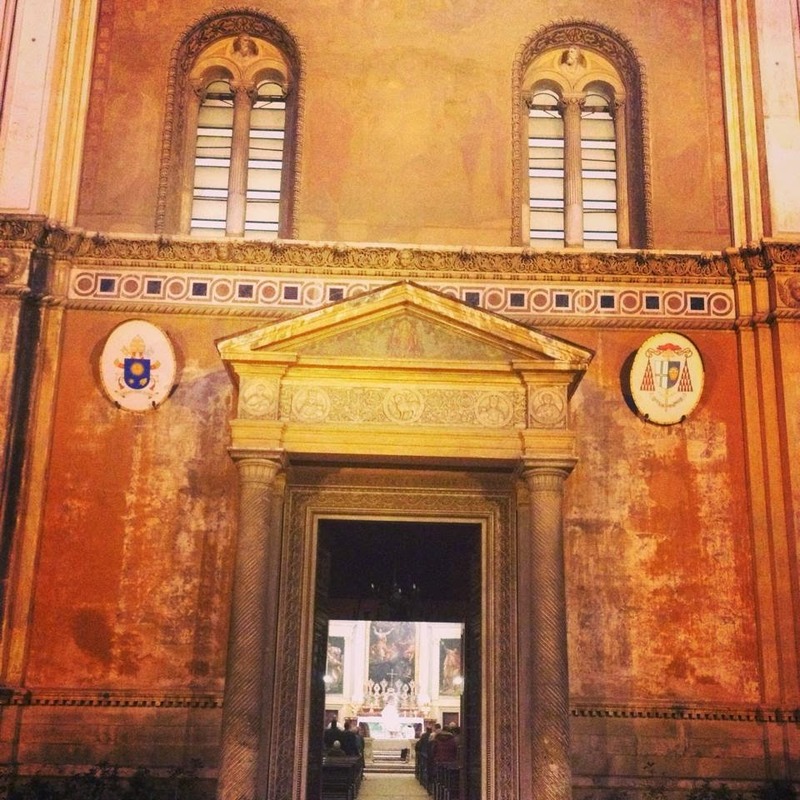 Guest Post: Liber Gradualis or Graduale Novum? Just Say No to '65! 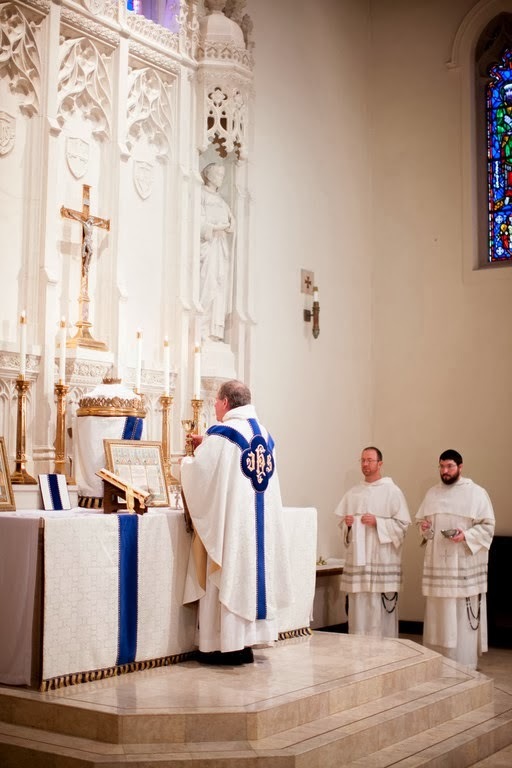 This is just the briefest of reminders to readers in the San Francisco Bay Area that the Dominican Rite Votive Mass of the Immaculate Heart of Mary will be sung by the student friars of the Western Dominican Province as part of First Saturday Devotions. The celebrant and preacher will be Fr. Byan Kromholtz, O.P., Assistant Professor of Theology at the Dominican School of Philosophy and Theology in Berkeley and Regent of Studies of the Western Province. This Missa Cantata will be at St. Albert the Great Priory Chapel, 6172 Chabot Road, Oakland CA, 94618, this Saturday, April 5, at 10:00 a.m. Confessions will be heard in the chapel from 9:30 to 9:50 before Mass, and recitation of the Marian Rosary will immediately follow it. Visitors and guests are welcome; pew booklets with the text of Mass in Latin and English will be provided. 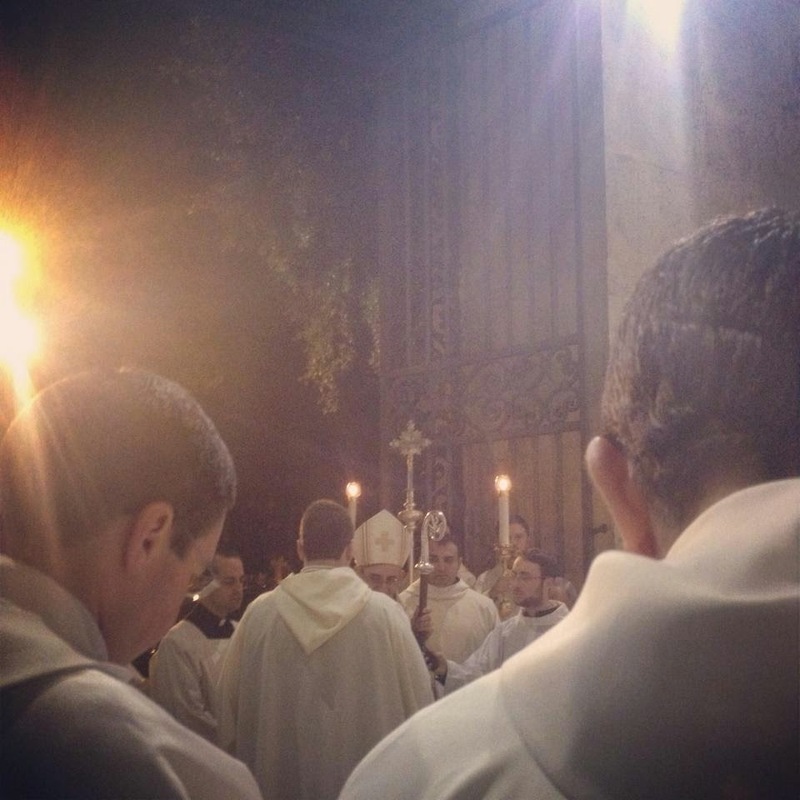 For more information on Dominican Rite Masses in the Bay Area, click here. 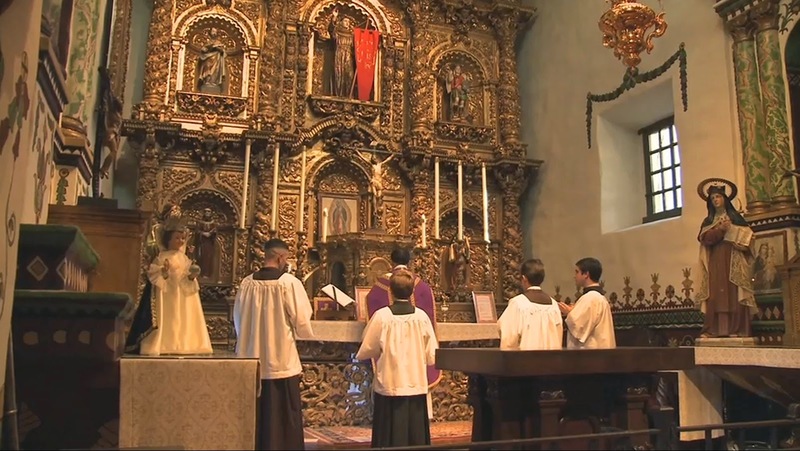 Regular attendees at our First Saturday Masses should know that the First Saturday Mass of next month, on May 3, will be at the Carmel of the Holy Family in Canyon CA and will be a Solemn High Dominican Rite Mass. 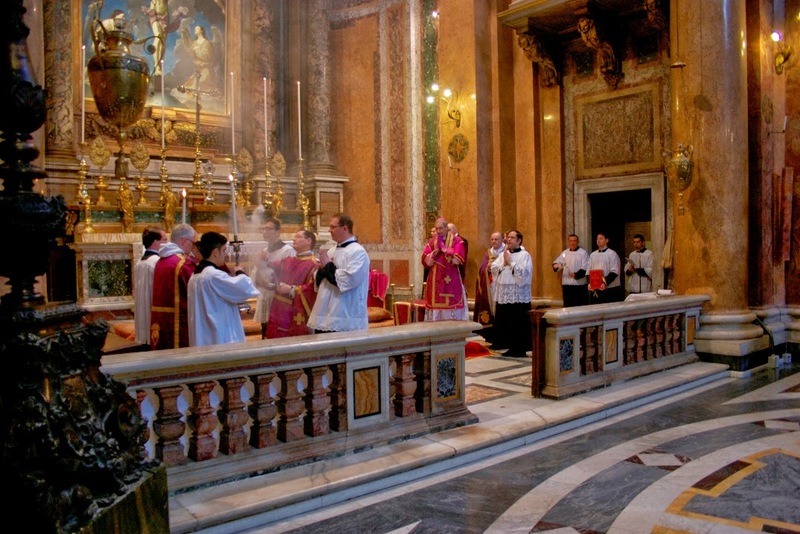 The Fraternity of St Peter’s Roman parish, Santissima Trinità dei Pellegrini, was very honored to welcome as the celebrant of the Mass for Laetare Sunday His Excellency Matteo Zuppi, the Auxiliary Bishop of Rome responsible for the pastoral care of the city center, including Trinità dei Pellegrini. 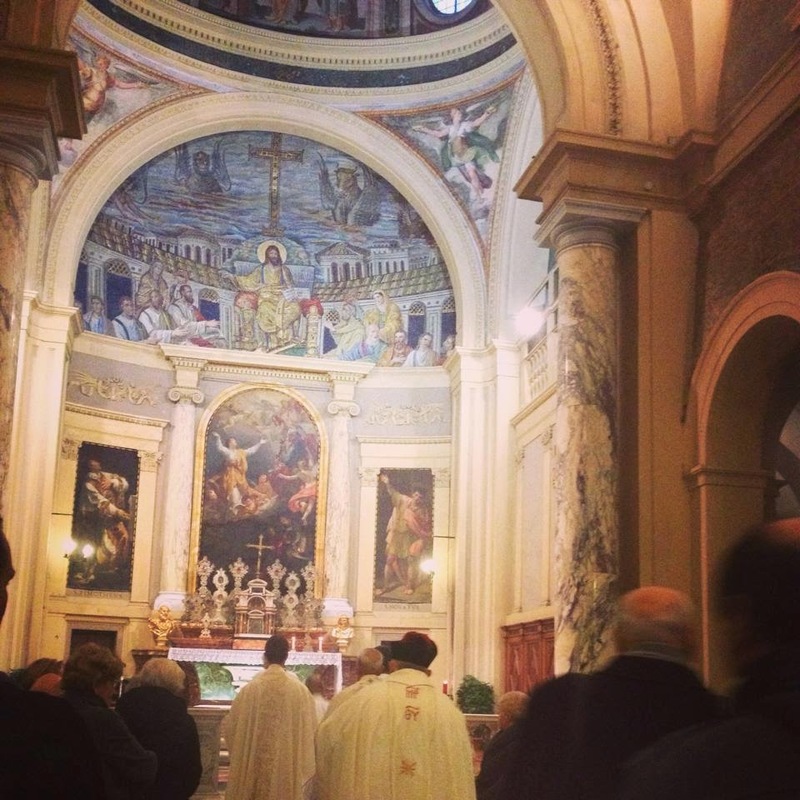 This was the first time that an auxiliary of Rome durante munere has celebrated Mass in the Extraordinary Form in a Roman parish since the post-Conciliar liturgical reforms began, and the whole parish community was very glad to accede to His Excellency’s request to say the Mass. The miter which His Excellency is wearing here was a gift to him from the parish. As Fr. 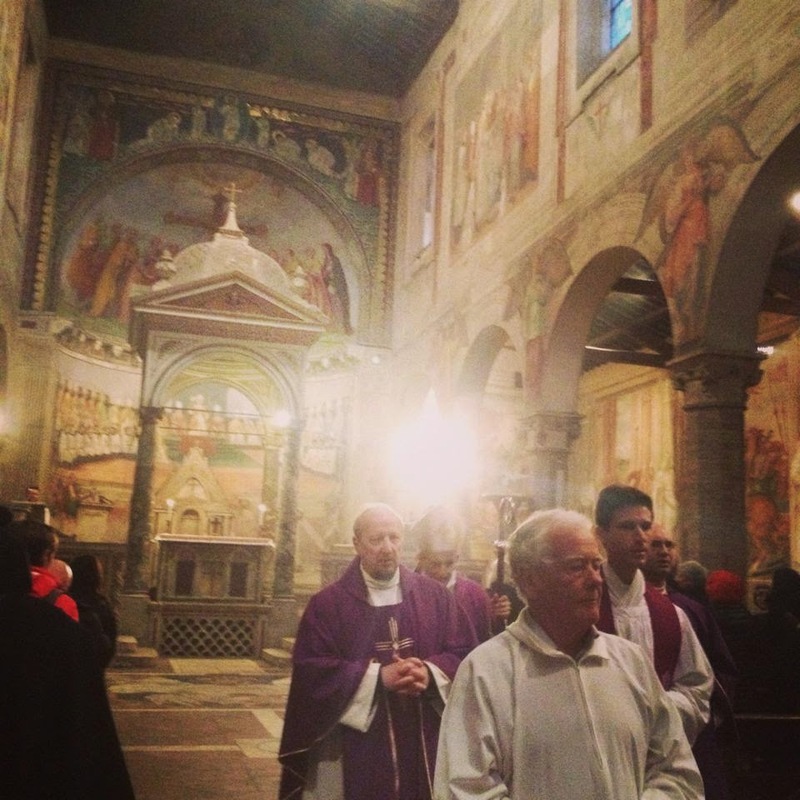 Joseph Kramer, the parish priest, stated when welcoming the bishop before the beginning of the Mass, “Monsignor Zuppi’s presence here today represents the union in law, but also in affection, which exists between this parish and the diocese of Rome. As pastor, together with all the members of the parish, we are happy to be united today with our bishop. ... We are very grateful to (him) that he wished to demonstrate that the Extraordinary Form has become part of the normal life of the Church, in the manner desired by Pope Benedict XVI in his moto proprio Summorum Pontificum. 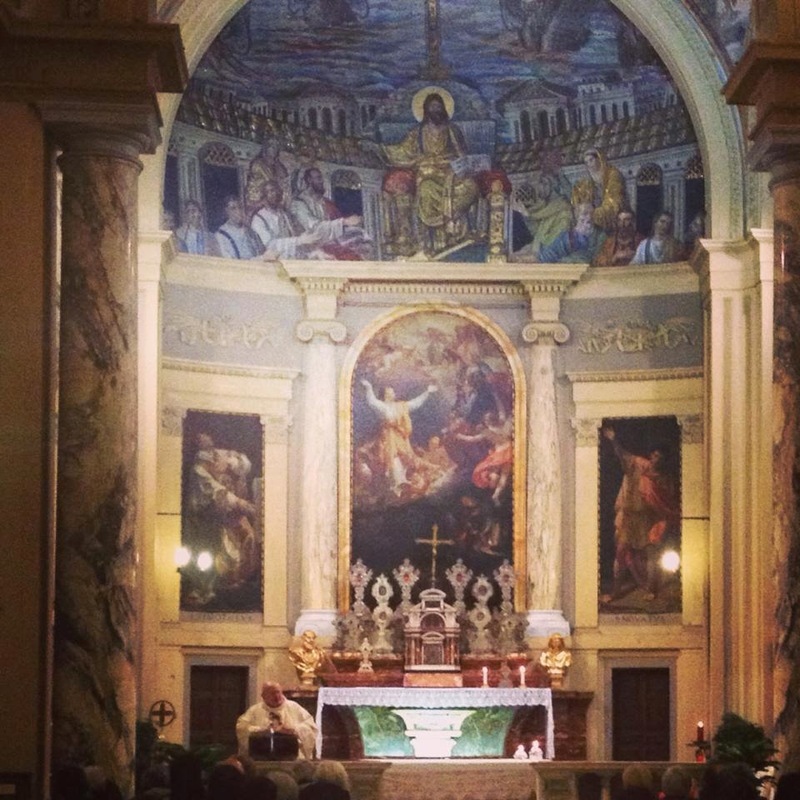 ... For our parish, it is very encouraging, Your Excellency, to have you with us today as a concrete and visible sign of your pastoral care for us.” NLM joins Fr Kramer, the parish and the FSSP in thanking Monsignor Zuppi for his pastoral solicitude towards the faithful who follow the Extraordinary Form, and all the faithful of the city of Rome. 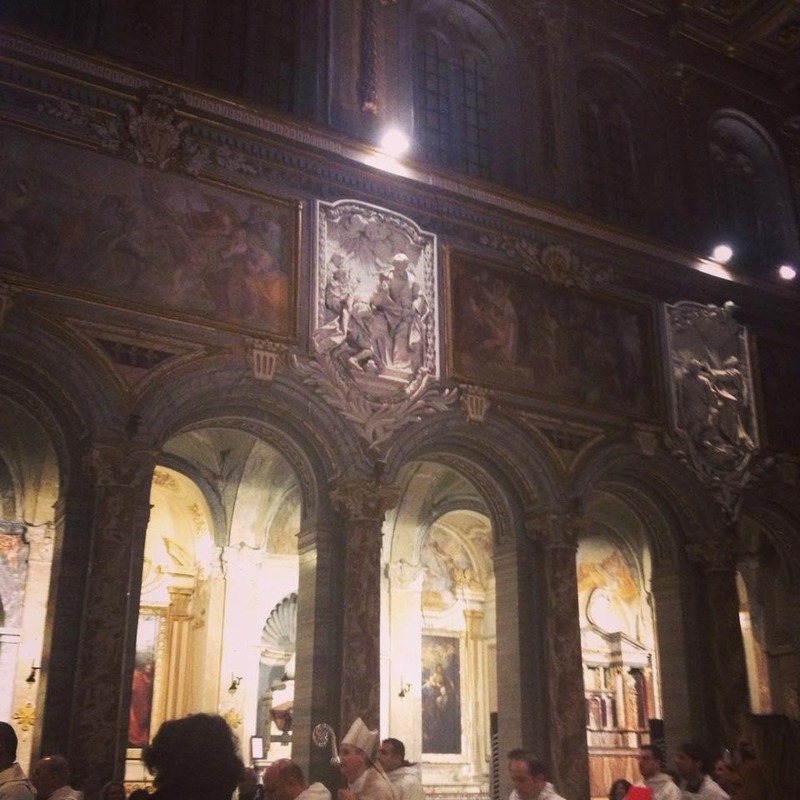 (Those who have followed our friend Agnese’s pictures of the Station Masses have seen that His Excellency has celebrated several of them.) Thanks also to the parish for making these photos available. The silver reliquary in the middle of the altar is of His Excellency’s name-saint, Matthew the Evangelist, to whom the altar of the church’s right transept is dedicated. The four statues are of the Apostles Peter, Paul, John and Matthew: the patrons and founders of the Church in Rome, the titular Saint of the city’s cathedral, and one of the patron Saints of the Confraternity of the Most Holy Trinity of the Pilgrims. 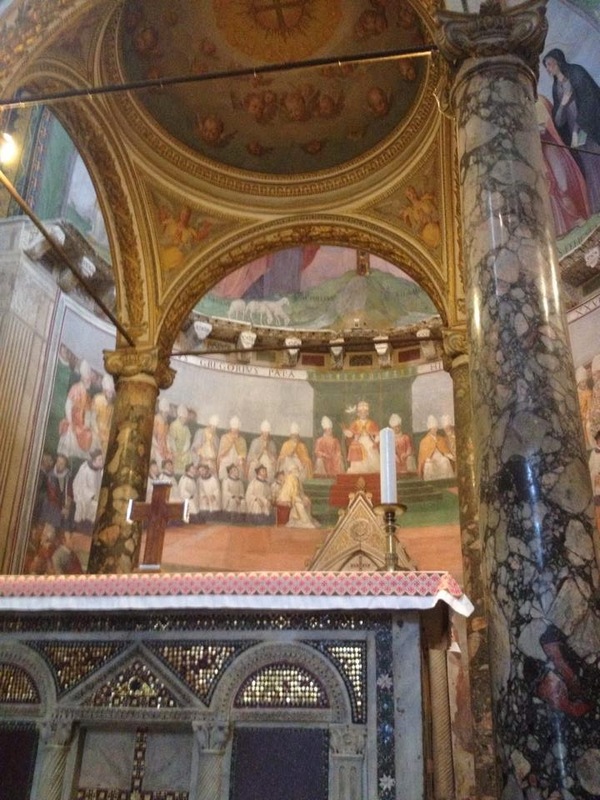 On Laetare Sunday, the altar may be decorated with flowers, but it was a common custom in Rome to use the metal flower arrangement seen here on the highest part of the altar. 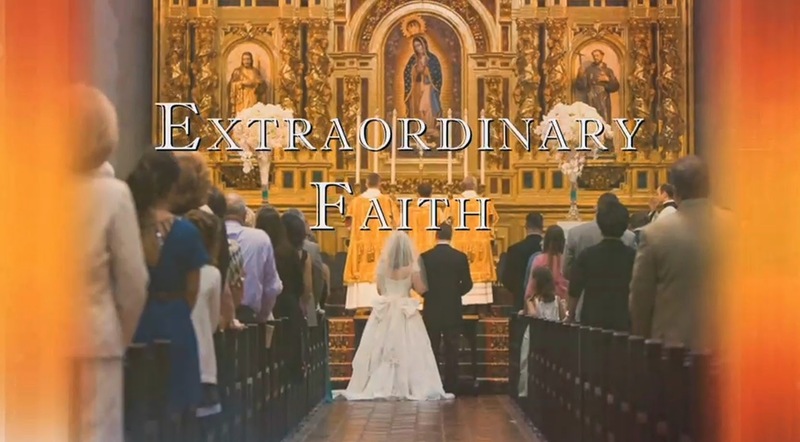 We are happy to bring you some exciting news from a new show launching on EWTN called "Extraordinary Faith TV." Having worked with the crew of EFTV on episodes about sacred music and the Latin Mass scene in Miami, I'm delighted to see the launch of this show on EWTN. I hope you'll be able to tune in to the broadcast, as well as view the episodes on their website after airing. Support from viewers will likely go a long way in securing a better time slot, as well as the production of more episodes. 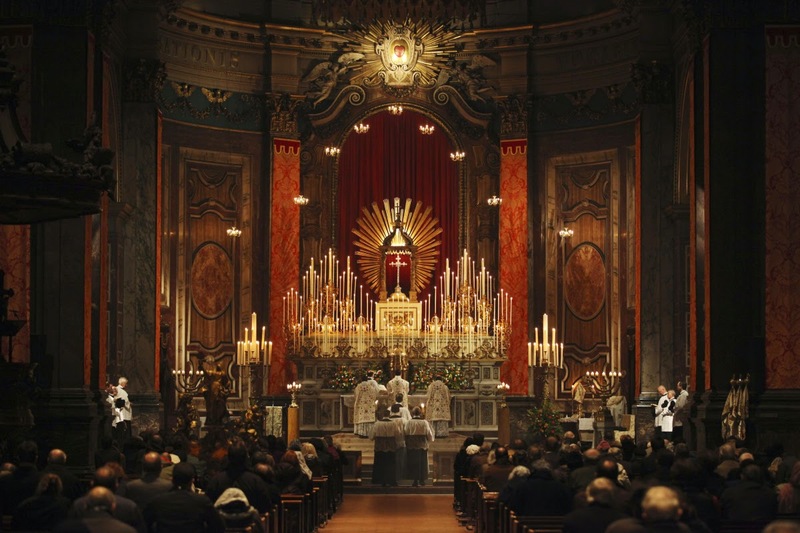 Quarant'ore at the London Oratory begins tomorrow (1 April) at 6.30pm with Solemn Sung Mass of Exposition and Procession of the Blessed Sacrament. On Wednesday 2 April there is Holy Hour and Benediction at 6.30pm, and on Thursday 3 April at 7pm, the Oratory Choir will sing Mendelssohn's Lauda Sion followed by Solemn Benediction to close the Forty Hours. Full details are here, and there are photographs from last year's Quarant'ore here. As we turn the corner into April 2014, when Pope Francis will canonize both John XXIII and John Paul II on Low Sunday/Divine Mercy Sunday, it behooves us to ask whether we have adequately grasped the spiritual profile of each one of the beati in question. With John Paul II still fresh in our memories, perhaps the question does not apply so much to him, but we may surely wonder how well the faithful actually know John XXIII and his teaching, more than fifty years after his death. For some decades, there has been in the Church a curious phenomenon that one might call “the conciliar caricature,” part of which is a tendency to speak as if Angelo Roncalli (1881–1963) came from outer space to bring deliverance and freshness to an antiquated Church that was serving out the stale bread of yesteryear. On the contrary, Pope John XXIII, elected supreme pontiff on October 28, 1958, was in many ways utterly traditional—arguably more so than his more philosophically adventurous and intellectually wide-ranging predecessor Pius XII. One need only read Blessed John’s beautiful diary, later published as Journal of a Soul and still in print, to discover the simple, hardy, and thoroughly traditional Catholic piety that nourished this man in the entire journey of his life. To his dying day John was convinced that the Church was possessed of a greater vitality than ever; that this vitality demanded of her a tremendous missionary effort for the leavening and transformation of the world; and that the Second Vatican Council he convened was going to bring about a deepened commitment to the religious life, a more forceful presentation of doctrinal truth, a more inspiring appeal to live the demands of the Gospel (see the Bull of Convocation of the Council, Humanae Salutis of December 25, 1961, and the address to the opening of the Council, Gaudet Mater Ecclesia of October 11, 1962). He was convinced, in short, that he was setting in motion the greatest missionary thrust since the age of the Apostles. That he would have been sorely distressed by the aftermath is unquestionable. A pope who, in the face of many demands for vernacularization, issued the apostolic constitution Veterum Sapientia (February 22, 1962) unequivocally reaffirming the centrality and permanence of the Latin language in the Church’s life and liturgy, or who in an apostolic letter shared with the world his consuming devotion to the Precious Blood of Jesus (June 30, 1960), was not the kind of man who was ready to throw out tradition. Probably the best way to appreciate how profound a lover of Jesus Christ and His Church was “good Pope John” is to read again his now largely forgotten encyclicals, several of which are truly outstanding for their rhetorical power, comprehensive approach, and sound pastoral wisdom. 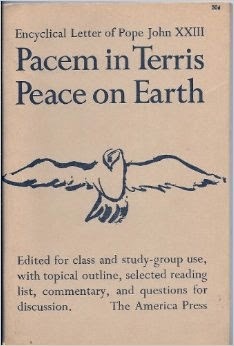 There were eight in toto, beginning with Ad Petri Cathedram (June 29, 1959), subtitled “On Truth, Unity, and Peace in a Spirit of Charity,” and ending with Pacem in Terris (April 11, 1963), over which the ailing pope labored tirelessly, so great was his desire to see it promulgated before his death. Here I wish to draw attention to five of the eight. A pope’s inaugural encyclical is always important (recall John Paul II’s Redemptor Hominis or Benedict XVI’s Deus Caritas Est). It says much about the way its author perceives his pastoral office and his role in the Church at that time. Pope John XXIII’s words near the start of Ad Petri Cathedram sound like an anticipation of Vatican II: “The Catholic Church is forever young and is indeed a standard raised before the nations. From her come a pervading light and a gentle love which reach all men” (n. 2). He announces his main plans: to summon an ecumenical council and a Roman synod; to revise the Code of Canon Law and to “issue a Code of Canon Law for the Church of the Oriental Rite” (n. 3). John XXIII immediately states his fundamental conviction, so contrary to the rampant relativism already characteristic of his time: “All the evils which poison men and nations and trouble so many hearts have a single cause and a single source: ignorance of the truth—and at times even more than ignorance, a contempt for truth and a reckless rejection of it. Thus arise all manner of errors, which enter the recesses of men’s hearts and the bloodstream of human society as would a plague. These errors turn everything upside down: they menace individuals and society itself” (n. 6). Yet, the pope goes on to say, God has made it possible for man to know truth, both by the light of his reason and by the light of faith. If we do not embrace the truth God grants us to know, we are rejecting the highest good and losing our sanity. If we reject the Gospel, we reject “the very foundations of truth, goodness, and civilization” (n. 8). These are sobering words, a wake-up call for a drowsy world. The remainder of the encyclical has the same tone. The sheer vehemence of style is reminiscent of Leo XIII, who is frequently cited with warm approval. John XXIII speaks of men who have “wandered pathetically far from the teaching of Christ” (n. 10), of the truth-attacker who “engages in an altogether despicable business’ (n. 11), of the movies and television programs that lead people into “loose morality and ignoble behavior, to treacherous error and perilous vice” (n. 14). He says we must fight with “weapons of truth” against these “weapons of evil” (n. 15) and error. The first error he castigates is the idea that “one religion is just as good as another” (n. 17). Not long after, he is critiquing the cult of progress and technology (n. 19) and underlining the duty of politicians to embrace the cause of truth if they wish to see any true peace and prosperity in their communities (nn. 21–22). The entire document sounds the note of rallying around the See of Peter for the fearless proclamation of the Faith. What is perhaps most surprising, in light of the “Roncalli myth,” is the uncompromising apologetic in which John XXIII engages on behalf of the unity and unicity of the Church, refuting Protestant and other errors and pleading with separated Christians to reunite themselves to the Church founded by Jesus Christ. No milquetoast minister he: the duty of every non-Catholic to convert and join the one true Church is emphasized again and again (see nn. 59–91). Sacerdotii Nostri Primordia (August 1, 1959), following hot on the heels of the inaugural encyclical, reveals the deepest yearning of John XXIII’s heart—building up the sanctity of the clergy, enkindling their zeal. He quotes St. Pius X: “Nothing is more needed to promote the kingdom of Jesus Christ in the world than the holiness of churchmen.” The encyclical is a beautiful recounting of the life and virtues of St. John Vianney on the occasion of the centennary of his death, interwoven with reflections and exhortations concerning the priesthood. 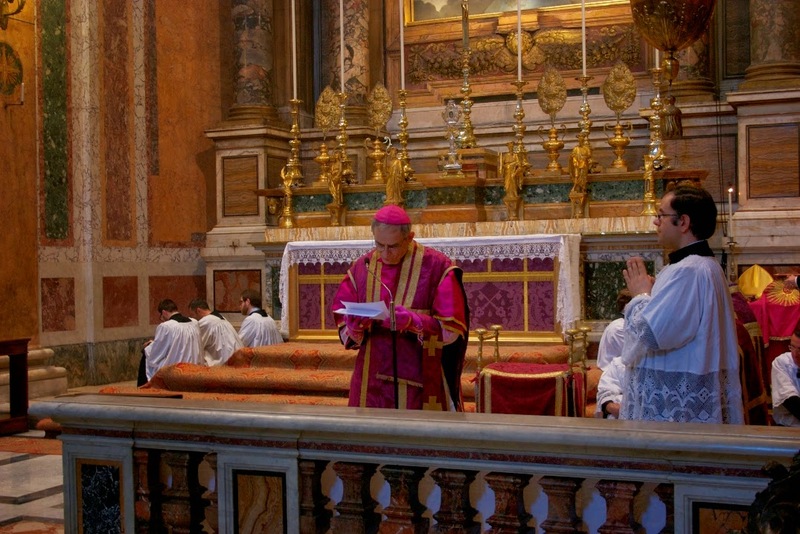 While addressed, as custom dictated, to the bishops, it is clear that the pope had in mind each and every one of his priestly sons, whom he beckons to the heights of perfection, as well as young men discerning a vocation. This wonderful meditation on priestly life should be obligatory reading for the ordained or those aspiring to ordination. The two mighty social encyclicals Mater et Magistra (May 15, 1961) and Pacem in Terris (April 11, 1963) would require little comment, if there had not been in the past forty years a serious neglect of the full scope and depth of Catholic social teaching—a neglect manifested by a narrow and superficial conception of the subjects it concerns, not to mention a Judas-like willingness to set aside major elements of this teaching whenever it becomes inconvenient or uncomfortable. In continuity with Leo XIII, a pope he dearly loved, Pope John XXIII recognized that the ultimate root of many economic injustices was a skewed understanding and perverted practice of politics. That is, the only viable solution to the “social problem” was the reconstitution of governments according to Catholic wisdom. Even if some particular descriptions or proposals in these two encyclicals seem dated to us in 2014—hardly surprising given the mutability of human affairs—their sound principles, systematic analysis, and biting critiques remain perfectly relevant to our day and age, and well deserving of our study. This pair of encyclicals simply must not be left unread by any Catholic who is concerned about doing his part to promote justice and peace. Then there is Aeterna Dei Sapientia (November 11, 1961), the encyclical with which John XXIII commemorated the fifteenth centenary of Pope St. Leo the Great’s death in 461. After recounting St. Leo’s doctrine and holiness, Pope John XXIII turns again, as he did in his first encyclical, to the subject of Church unity, and gives us a brief and compelling treatise on the true Church of Jesus Christ and the ineradicable, irreducible role the papacy plays therein. The Pope then states his hopes for the approaching Council: “We are fully confident that this solemn assembly of the Catholic hierarchy will not only reinforce that unity in faith, worship, and discipline which is a distinguishing mark of Christ’s true Church, but will also attract the gaze of the great majority of Christians of every denomination, and induce them to gather around ‘the great Pastor of the sheep’ who entrusted His flock to the unfailing guardianship of Peter and his successors” (n. 62). 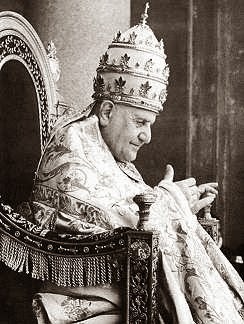 A pattern has thus emerged: in spite of his failings—of which no pope, or no Christian whatsoever, can be completely free in this life—John XXIII ought to be remembered above all for his fearless and articulate defense of all that is distinctively Catholic, as well as for his persuasive and positive way of presenting it. We would do well to return to these sources of sound doctrine; we might even promote the encyclicals mentioned above as readings in parish groups or among friends. It would be a small but effective step towards appropriating the legacy of a pope whose real teaching and real sanctity have been largely forgotten. 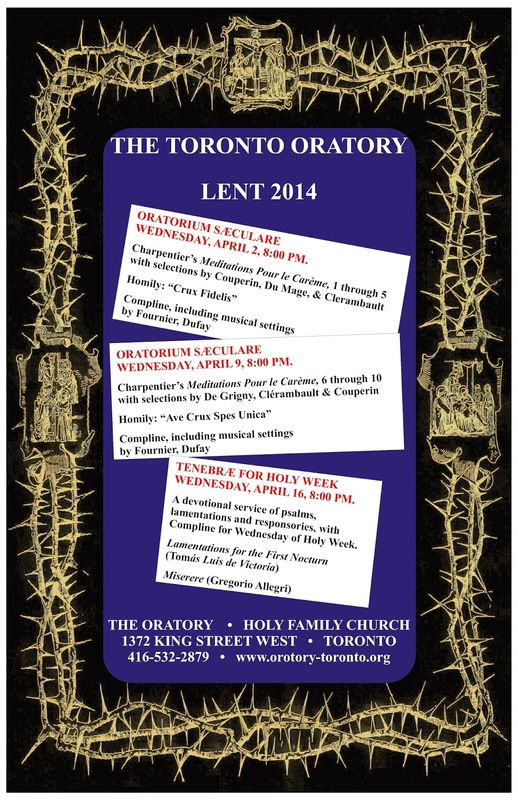 In the Byzantine liturgy, each of the Sundays of Lent has a special commemoration attached to it. The first Sunday is known as the Sunday of Orthodoxy, because it commemorates the defeat of iconoclasm and the restoration of the orthodox belief in the use of icons; many churches have a procession in which the clergy and faithful carry the icons, as seen in this video from the Sacred Patriarchal Monastery of St. Irene Chrysovalantou, in Astoria, New York. The Third Sunday of Lent is called the Sunday of the Adoration of the Cross; in place of the Trasagion are sung the words “We venerate Thy Cross, O Lord, and we glorify Thy holy Resurrection.” A Cross is placed in the middle of the church, and “We venerate Thy Cross” is sung again three times, as all prostrate themselves before It, and then come forth to kiss it. The traditional Old Church Slavonic melody is in my opinion one of the most beautiful pieces in the repertoire. The Fourth Sunday is dedicated to St John of the Ladder, whose Greek title (“tēs klimakos - of the Ladder”) is often improperly Anglicized as “Climacus.” This year, his Sunday falls on the same day as his feast, March 30. The title refers to his popular and extremely influential spiritual treatise, the Ladder of Paradise, still commonly read, and especially in Lent, among Eastern Christians. The treatise is also known as the Ladder of Divine Ascent, and outlines thirty steps by which, through the acquisition and exercise of the various virtues, one may seek to ascend to attain to salvation. 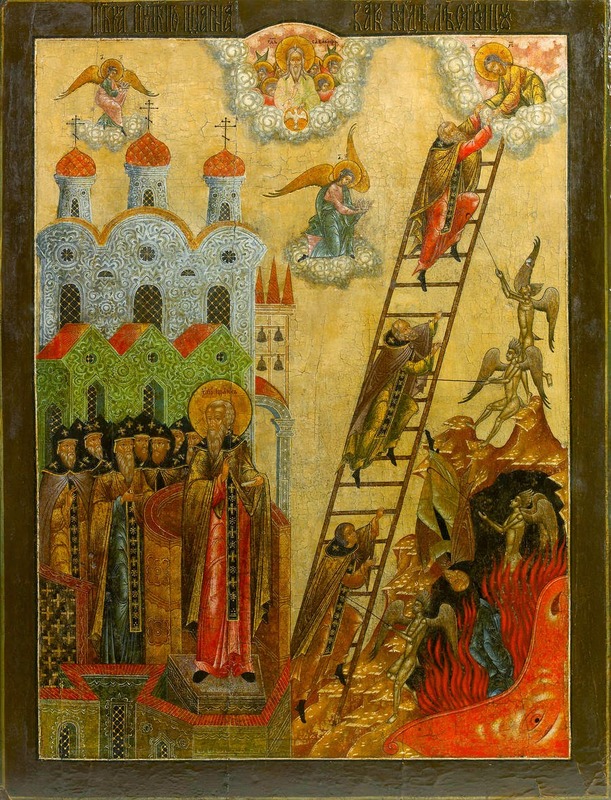 The icon of his feast shows him indicating the ladder by which a group of monks are shown the ladder to Heaven; with an important touch of realism, all versions of this icon show some of the monks being pulled off the ladder by devils with grappling hooks, and falling into the mouth of hell on the lower right. Very little is known about St John’s origins and life, and even the exact period in which he lived has been the subject of academic debate. A letter of Pope St Gregory the Great in the year 600 is addressed to one John, the “abbot of Mount Sinai”; John Climacus certainly held this office at one time, and he is traditionally said to be the recipient of letter, and to have died at around the age of 75 a few years later. Others place his life at a later period, from roughly 580-650. The Troparion of the Sunday : Dweller of the desert and angel in the body, you were shown to be a wonder-worker, our God-bearing Father John.You received heavenly gifts through fasting, vigil, and prayer, healing the sick and the souls of those drawn to you by faith. Glory to Him who gave you strength! Glory to Him who granted you a crown! Glory to Him who through you grants healing to all! The Kontakion : The Lord truly set you on the heights of abstinence, to be a guiding star, showing the way to the universe, o our Father and Teacher John. Below, you can find pictures of liturgies St. Joseph's feast day. Also, don't forget to send your rose photos tomorrow to photopost@newliturgicalmovement.org! The Lothair Crystal, also known as the Susanna Crystal, ca. 865 A.D., now in the British Museum in London. The 15th century bronze frame may have been added to turn it into a morse, the large clasp that closes a cope at the front. The crystal was cracked when the monastery where it had been kept for centuries was sacked during the French Revolution, and it was thrown into the Meuse River. The holes in the frame formerly held jewels. The story as depicted here starts on the upper left and runs clockwise; the latticed enclosure is the garden where the two elders have accosted Susanna as she bathes. To the right of the lattice (in the upper part of the crack), two servants turn to Susanna’s aid as she cries out for help. In the middle of the right side, the two elders stand before Joachim’s house, demanding that Susanna be brought forward for judgment; immediately below, they accuse her by placing their hands over her head, while the bystanders express their astonishment. Beneath that, an official with a staff in his hands leads Susanna off to execution, but is stopped by the Prophet Daniel. On the lower left side, Daniel reproves the first elder, and above that, convicts the second of lying. The two elders are then stoned to death. In the central medallion, Susanna stands before the judgment seat of Daniel, her arms stretched out in a gesture of thanksgiving, with two other men (one perhaps her husband) on the left. The art historian John Beckwith correctly noted that “Susanna was regarded in early Chrstian times as a symbol of the persecuted Church … and there can be no doubt that an early Christian model was at hand when the crystal was carved.” (Early Medieval Art, p 68). In point of fact, the elders accusing Susanna by placing their hands on her head, and Susanna giving thanks for her delivery with arms outstretched, are both portrayed in exactly the same way in the Catacombs of Priscilla, in an image dated to the early decades of the 3rd century. 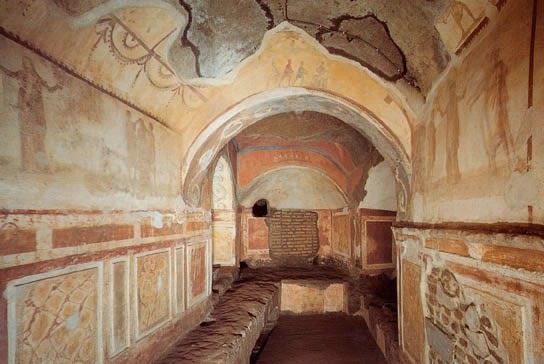 The so-called Greek Chapel (really a funerary chamber) within the Catacombs of Priscilla, ca. 225 A.D. On the right side, the elders lusting after Susanna, pointing at her mid-riff. One the left side, (further from the camera) the elders accuse Susanna by placing their hands on her head; on the right, Susanna and Daniel (not seen here) give thanks for her deliverance. 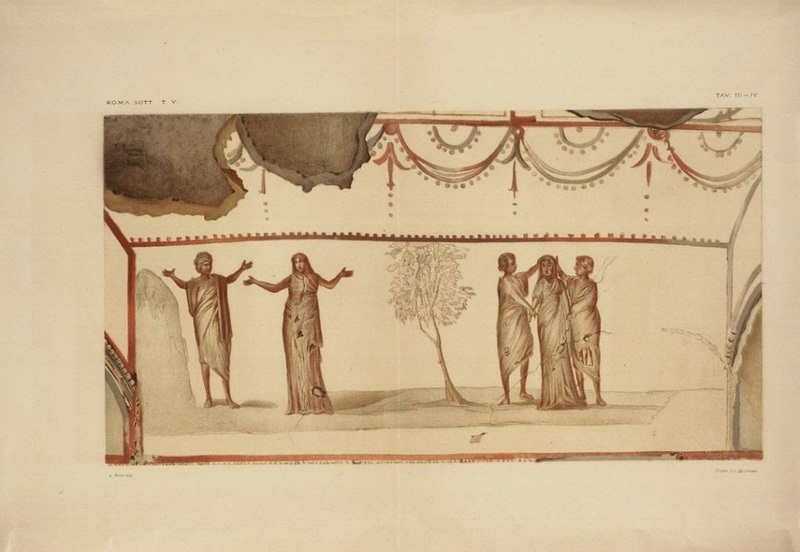 A drawing made in 1880 of the fresco seen above on the left side of the Greek Chapel, in which the accusation of Susanna, and Susanna giving thanks for her deliverance are represented much as they are on the Lothair crystal over 600 years later. 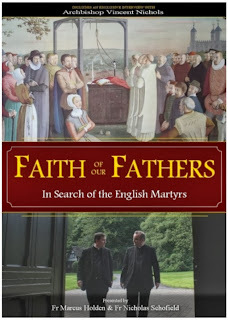 The beautiful film 'Faith of our Fathers' which featured in this post is now available to readers in North America and Canada in a 95 minute DVD (Region 1 NTSC) which you can order from Ignatius Press here. Presented by Fr Marcus Holden and Fr Nicholas Schofield, priests of the Dioceses of Southwark and Westminster, the film, about the English Martyrs, features interviews with Lord Camoys, Archbishop Nichols of Westminster (now Cardinal) and Martin Baker, Master of music at Westminster Cathedral. A trailer is available at the original post. Highly recommended. 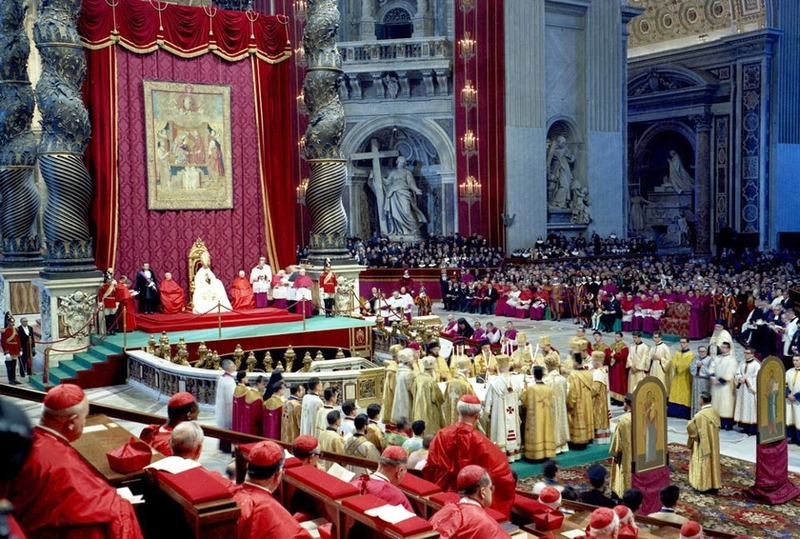 The Church at the Close of an Age: Postconciliar Catholicism at the End of the Generation of Vatican II,” is the topic of a conference, sponsored by the St. Hugh of Cluny Society on April 4 at 7 p.m. at the Union League Club. The conference is preceded by Solemn Vespers in the Extraordinary Form at 5:30 in St. Patrick's Old Cathedral in Lower Manhattan. The conference features Dr. Roberto deMattei, professor of Christianity at the European University in Rome, and Dr. John Lamont, Thomistic scholar and philosopher of Sydney, Australia. Both are well-known scholars, who have courageously defended traditional theological positions throughout their respective careers. 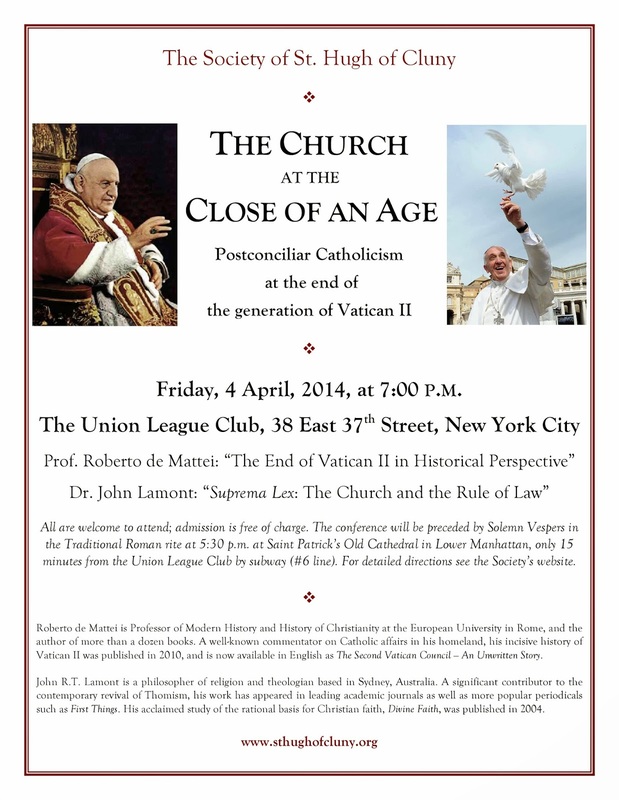 For more information check the St. Hugh of Cluny Society website at: http://sthughofcluny.org/2014/03/upcoming-lectures-by-roberto-de-mattei-and-john-lamont-2nd-notice.html. This is the fourth in a continuing series of articles. The previous parts may here read here: part 1, part 2, part 3. A common objection to the traditional form of the Offertory prayers is that they “anticipate” ideas of the Canon. For example, in his memoire The Reform of the Liturgy, 1948-1975, Abp. 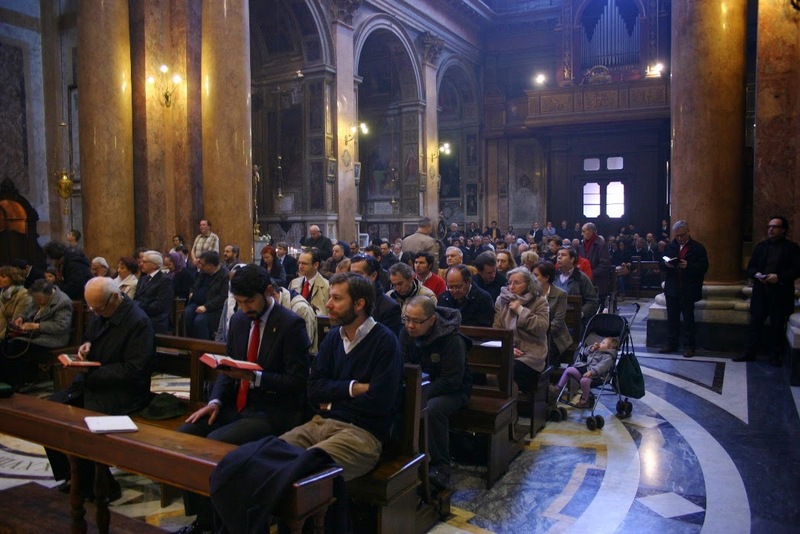 Bugnini, one of the principal architects of the post-Conciliar reform, refers to the debate over the Offertory by the committee which created the reform. On reading the full account, the members of the Consilium do not seem especially harsh or polemical in their critique of the Offertory; rather, they seem to have simply taken it for granted that it would be extensively revised. 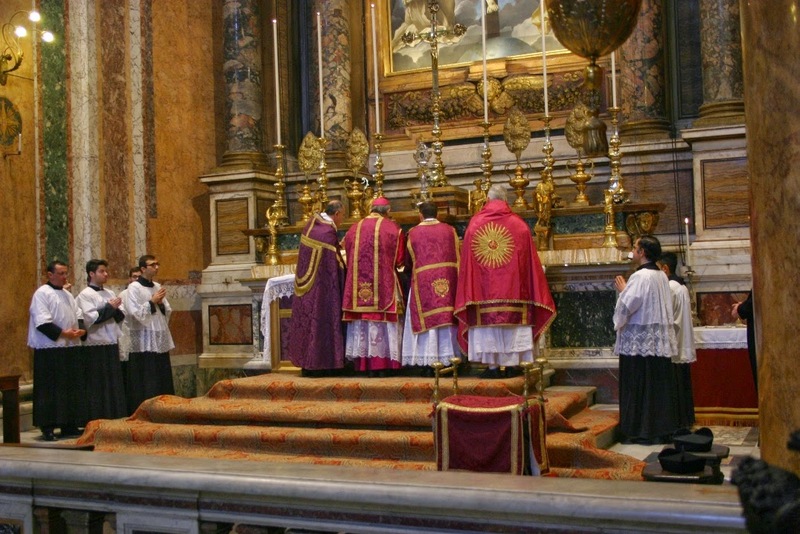 It must be said that here, as in many other places, the revision which they eventually produced went far beyond the mandate of Vatican II’s document on liturgical reform Sacrosanctum Concilium, which does not even mention the Offertory. 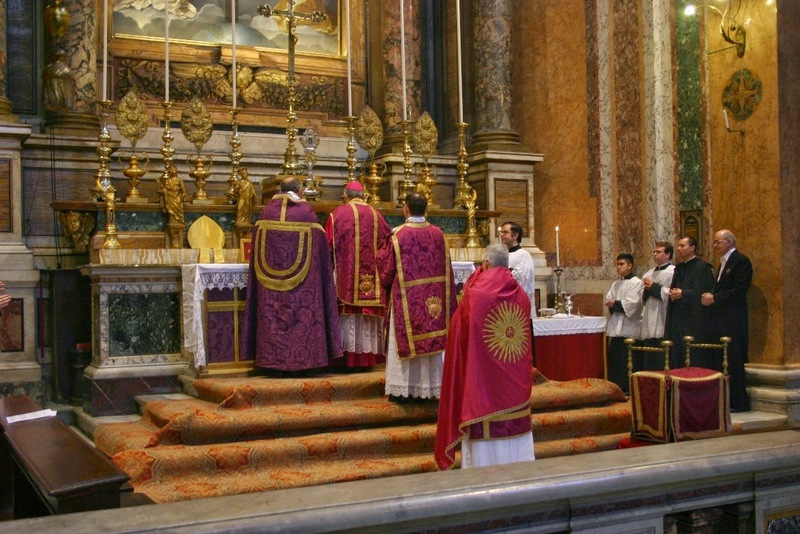 Now, one may simply take the position that the revision in itself is a good thing, or even an improvement, without necessarily accepting any given prior critique of the Offertory found in the Missal of St Pius V. However, if one wishes to state that the Offertory improperly anticipates the ideas of the Canon, such a statement poses a significant problem for ecumenical relations with those who use the Byzantine Liturgy in its various recensions and languages. The Byzantine tradition is in fact very much in agreement with the Roman tradition in its manner of preparing the Eucharistic sacrifice, and does so in a manner that “anticipates” that sacrifice much more explicitly. The Greek word for the Byzantine preparation ritual is “proskomedia”, the two elements of which, the preposition “pros” and the verb-root “komid-”, correspond quite closely in sense to the Latin preposition “ob” and the verb-root “fer-” in the word “offertorium”. The website of the Greek Orthodox Archdiocese of America translates the word as “the Office of Oblation”, and it is indeed an Office unto itself, very much longer and more complex than any form of Offertory in any Use of the Roman Rite. I shall not here attempt to give a complete explanation of it, but only outline some of the more salient points where it is conceptually similar to the traditional Roman Rite. This description follows the text of a Hieratikon (priestly service-book) published by the Greek Orthodox Church in 1977. 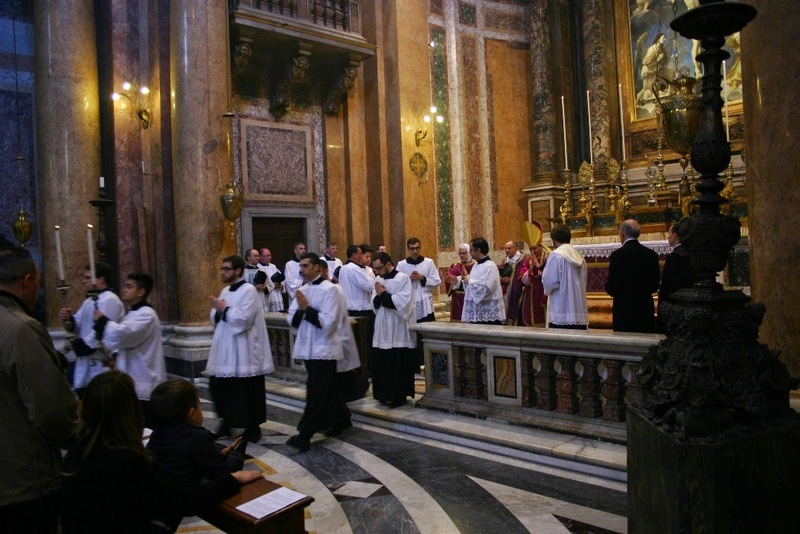 Just after the opening prayer, the priest takes the bread, which is called “prosphora – an offering”, and lifts it up with both hands, raising his eyes to heaven, exactly as in the Roman Offertory at the prayer Suscipe Sancte Pater. As he raises it he says “Thou has redeemed us from the curse of the Law by Thy precious blood; being nailed to the Cross, and pierced with the lance, Thou didst pour forth immortality unto men; glory to Thee, our Savior.” The deacon then says to him, “Bless, lord,” and the priest makes the sign of the cross over the diskos (a plate on a base) with the prosphora and the implement which is used to cut it. The latter is called a “lance”, not a knife; the Greek word for it, “lonkhe”, is the word St John uses (19, 34) for the soldier’s lance that pierced Christ’s side. 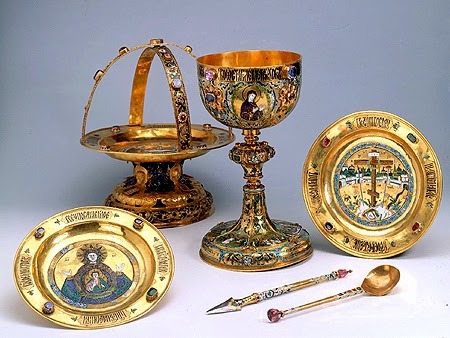 Vessels and instruments for the Byzantine Liturgy made in Moscow in 1679, now in the treasury of the Hermitage Museum in St Petersburg. The lance is the pointed object lying flat, right beneath the chalice. The stabbing of the Lamb during the Proskomedia. The deacon says “Pierce (nuxon), lord”, at which the priest pierces it with the lance on the left side, saying the words of the Gospel of St John, “One of the soldiers with his lance pierced (enuxe) His side, and at once there came out blood and water. And he that saw hath born witness, and his witness is true.” The deacon then pours wine and water into the chalice, asking the priest to bless them, “Bless, lord, this union”. 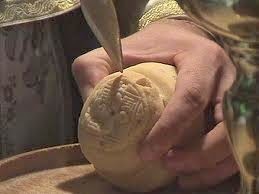 The priest makes the sign of the cross over it saying, “Blessed be the union of Thy holy things”. 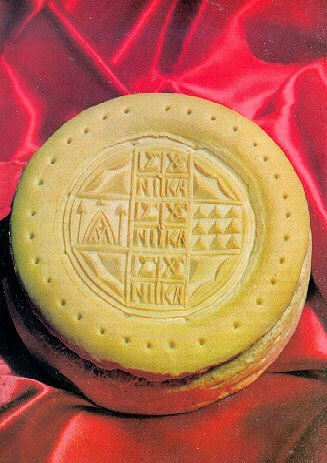 A diagram showing the placement of the various pieces of the prosphora on the diskos. Note that the piece in honor of the Mother of God is on the left, although the rubrics of the Hieratikon say that it goes on the right, in imitation of the words of Psalm 44, and those of the “ranks” of the Saints are on the right. The “right” side of the Lamb is treated as if He were lying on the diskos facing outwards, in which case His right is our left. 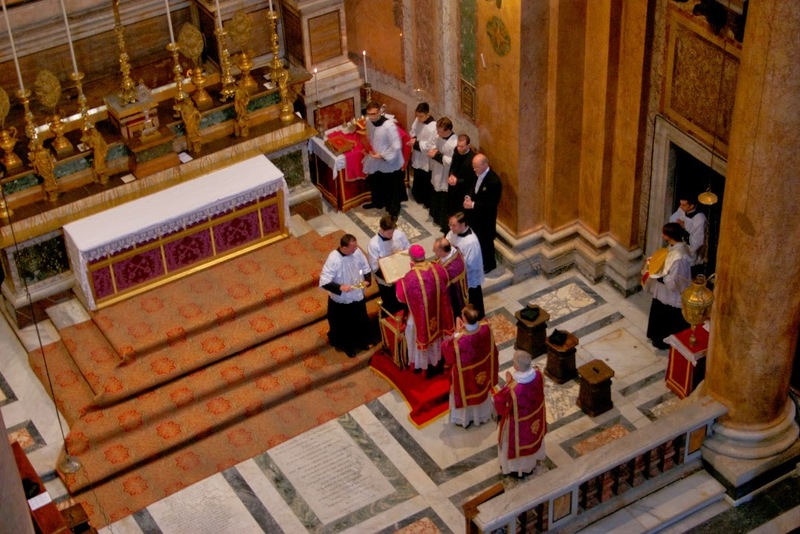 The priest then says a long prayer for the clergy and people, and another “for the souls of those in blessèd rest”; the latter begins, “Again, we offer to you this sacrifice…” In the same way, the first prayer of the Roman Offertory asks God to receive the Host “for all faithful Christians, living and deceased.” At the end of either prayer, the priest may add the names of those for whom he offers the Divine Liturgy, saying “Remember, o Lord, (name)”; as he says each name, he lays another piece of the Lamb or of another prosphora on the diskos. This serves the same purpose as the two Mementos of the Roman Canon, even though there is another opportunity for the priest to name both the living and the dead during the anaphora. 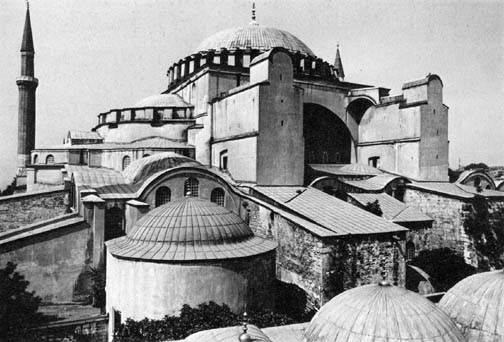 Hagia Sophia, seen from the northeast; the skeuophylakion is the round building in the left foreground. 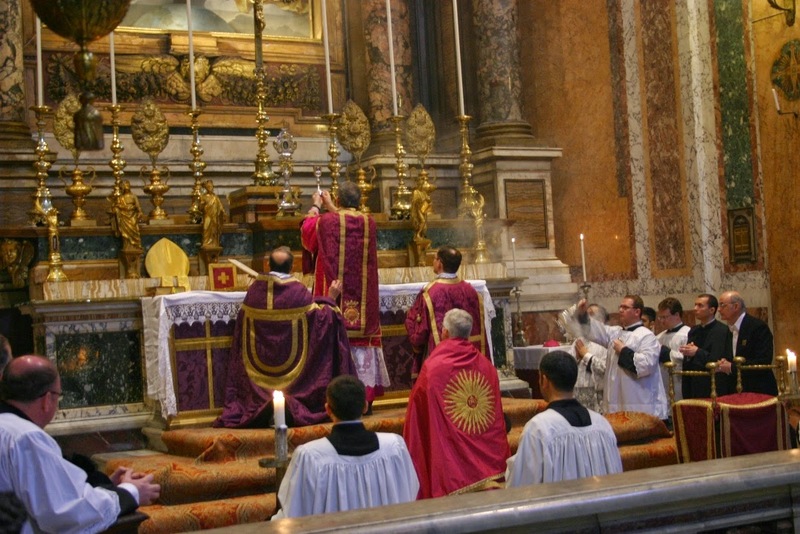 In all of this, one cannot fail to notice to what degree the Byzantine Rite “anticipates” the Eucharistic Sacrifice in these rites of preparation: repeated and explicit reference to the Passion; the physical preparation of the bread and wine with words like “sacrifice”, “crucify” and “pierce”, as well as “offering”; calling the bread “the Lamb”; placing individual pieces of bread on the plate as part of the Mementos of the living and the dead; all this before the Divine Liturgy itself has even begun; and formerly, in the Mother Church of the Byzantine Liturgy (and elsewhere), in a completely different building. Now if any of this were true, the Byzantine Rite, which enthusiastically “anticipates” the Eucharistic sacrifice in the Proskomedia, would also represent a radical departure from the teaching of the Fathers. And, it must be added, this theoretical departure would have taken place without the help of the Scholastics, whose influence in the Byzantine world was never very strong, and who were essentially rejected in the Hesychasm controversies of the 14-century. Likewise, if, as Consolamini claims, the 1970 revision of the Offertory meant that the Roman Catholic Church had returned to the previously lost Apostolic and Patristic heritage, the unavoidable corollary would be a heavy slap in the face to the Orthodox. A Byzantine Divine Liturgy being celebrated in the presence of the Pope during the Second Vatican Council. In the previous article of this series, I have explained that it was in no wise the intention of Pope Paul VI to change the Church’s theology of the Eucharistic sacrifice, much less to change it back to something from which it had putatively gone astray. 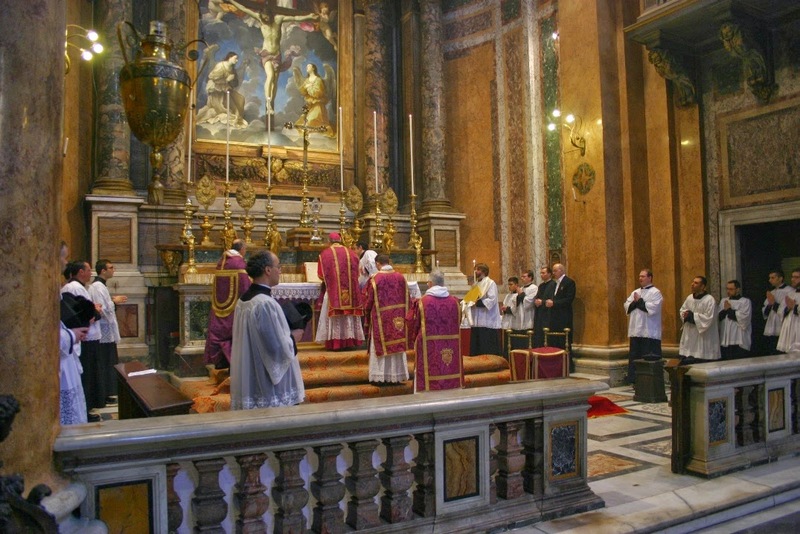 More recent Papal legislation has also fully repudiated the critique of the traditional Offertory as intrinsically problematic, and the implicit critique of the Byzantine tradition. 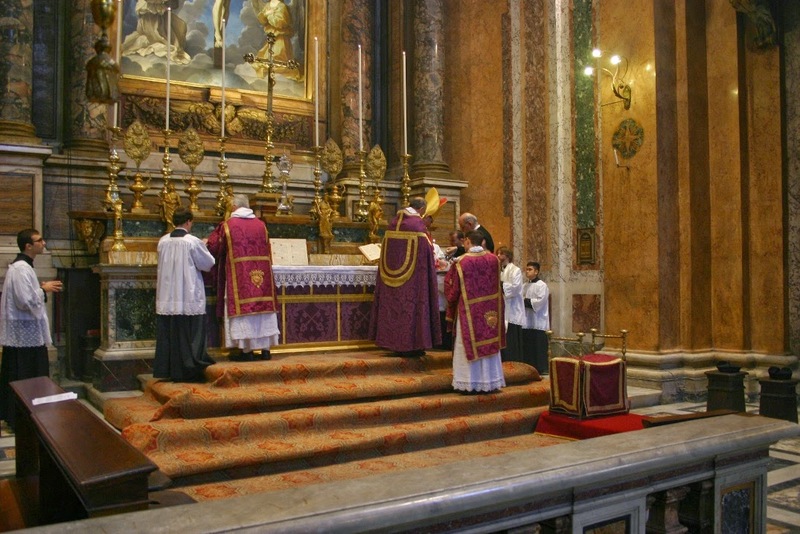 The motu proprio Summorum Pontificum has established the traditional Ordo Missae, and with it the Offertory rite, as part of the Roman Rite on a par with that of the Novus Ordo. Furthermore, the recently approved liturgy of the Anglican Use Ordinariate contains as an option the full text of the traditional Offertory rite in English. Good news begets more good news it seems. First San Francisco, then Portland, Jamaica and now I have been contacted by someone telling me about another Oratory in Formation and asking me to raise awareness. The Oratory in Formation in Brisbane, Australia would be the first in Australia and Oceania. It appears to be gaining ground already as it has just announced the identity of the third priest who will be newly joining the community. they have one novice already. You can read about it on their website here. While they haven't asked for money, only prayers, I am sure that like most communities who are looking to establish themselves and attract members and find a permanent home, I am sure donations would be welcome. So on their behalf I would happily push any who might be interested in their direction. 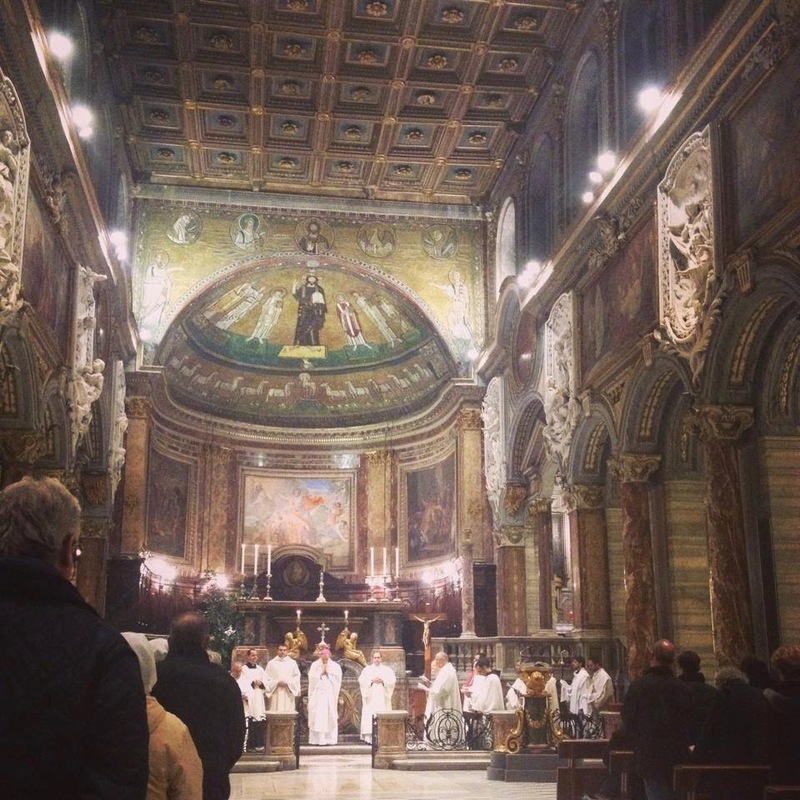 For any readers who might be curious as to my strong interest in the Oratorians, here is a link through to my article on how the liturgy at the London Oratory influenced my conversion. May God bless their work. 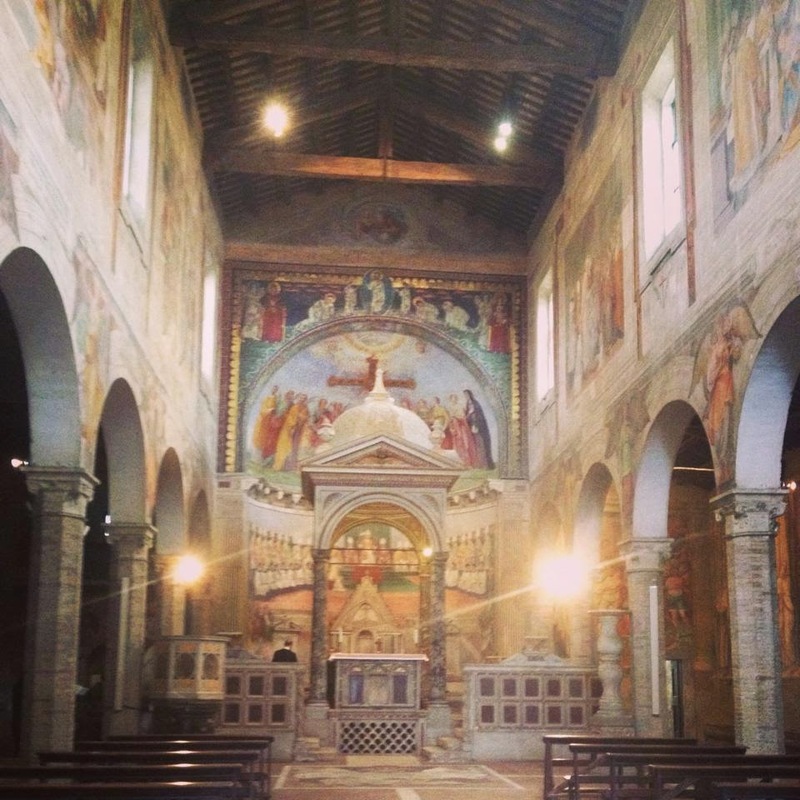 This basilica was originally built in honor of Saint Mark the Evangelist by the only Pope of the same name, who ruled for 10 months in the year 336. Because St Mark is the Patron Saint of Venice, it has often been given as the cardinalitial title to the Patriarchs of Venice; six Popes have been elected while cardinal of this church, four of whom were Patriarch at the time of their election. 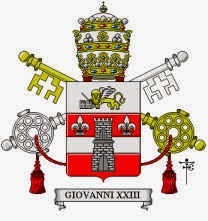 (Gregory XII, 1406-15, the last Pope to resign before Benedict XVI; Paul II, 1464-71; Clement XIII, 1758-69; and John Paul I, 33 days in 1978.) 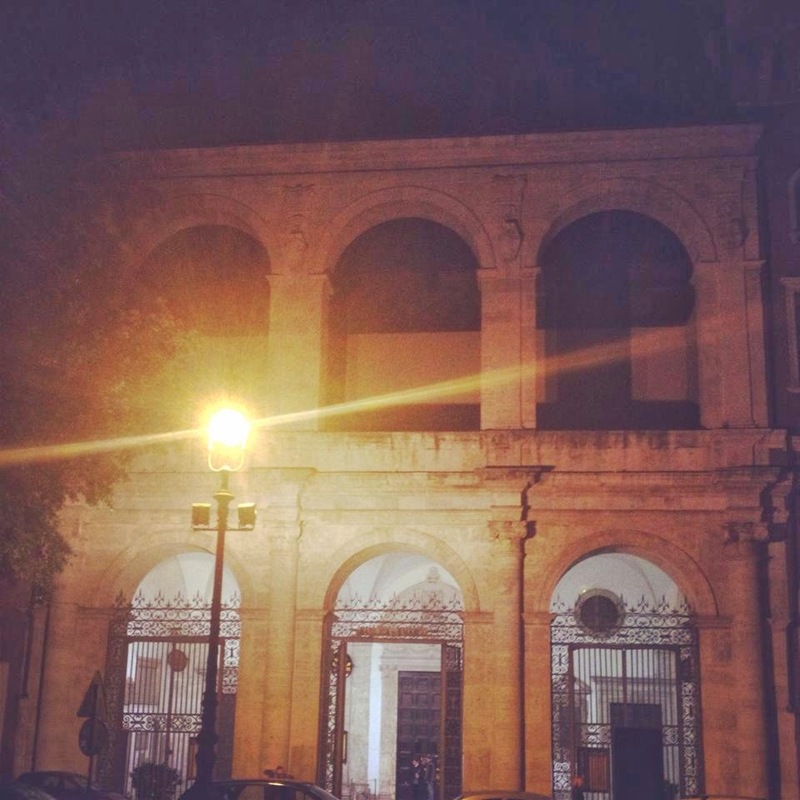 The church is now surrounded on three sides by the Palazzo Venezia, formerly the embassy of the Venetian Republic to the Papal States. 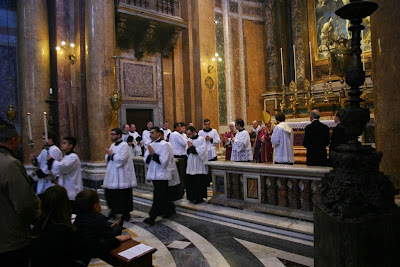 The Mass was the vigil Mass of the feast of the Annunciation, rather than the feria of Lent; hence the white vestments. 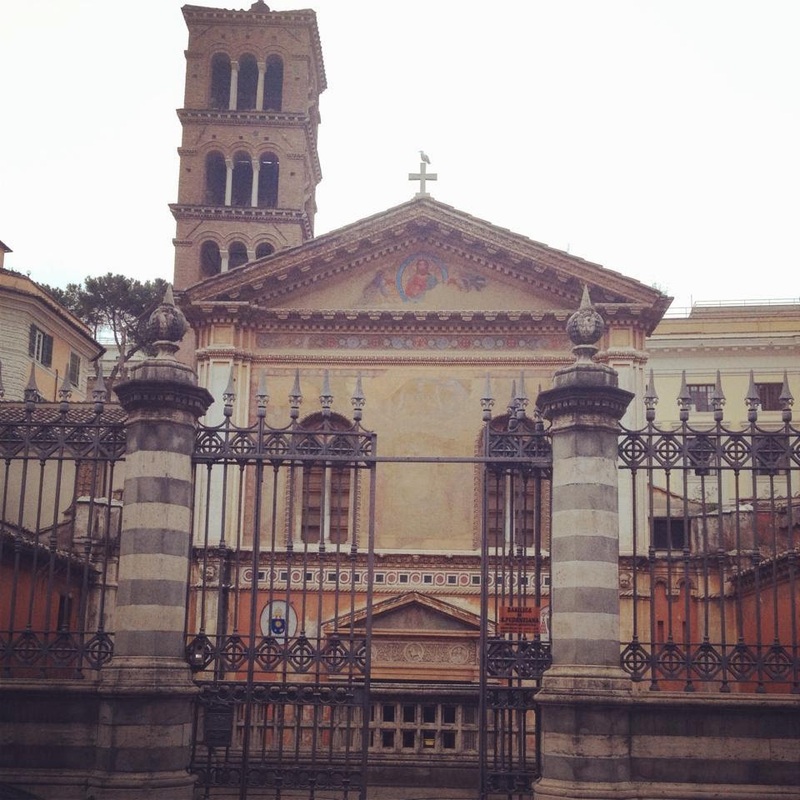 Like the church of San Vitale which we saw last week, the Basilica of Saint Pudentiana is now sunk below the street level, as new layers of buildings have been built up around it. In the 1920s, the church required such an extensive renovation that an alternative station was appointed for this day at the church of St Agatha. 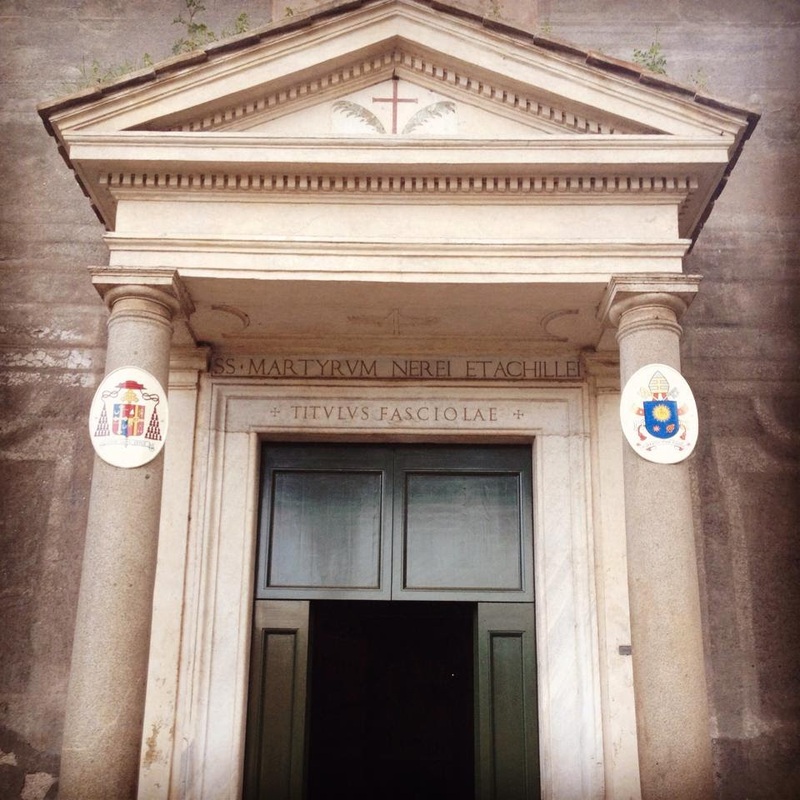 From 1556 to 1565, the Cardinal-Priest of this church was Scipione Rebiba; the vast majority of Latin Rite Catholic bishops (and therefore the priests ordained by them) today derive their Apostolic succession from this man through Pope Benedict XIII (1724-30). The apsidal mosaic was made around the end of the 4th century. It has been heavily patched and restored, and clipped off at the edges by a major renovation of the 1590s; despite this, it remains an important example of the early Church’s use of the images of imperial power. Christ is dressed as the Emperor, and the Apostles as the senators. Many of the early Christian Emperors did not believe that their authority ended at the church’s door, and many of the early heresies were either promoted or created by the Roman Emperors. Images of this sort send the message that in the Church, Christ and His Saints are the ruling power. 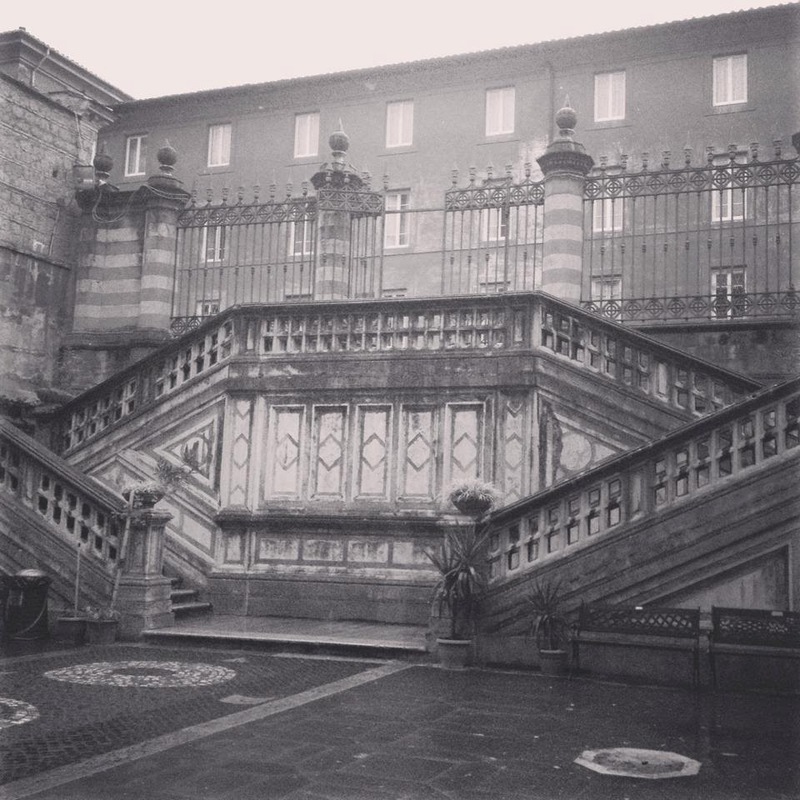 The staircase by which one descends to the modern level of the church. 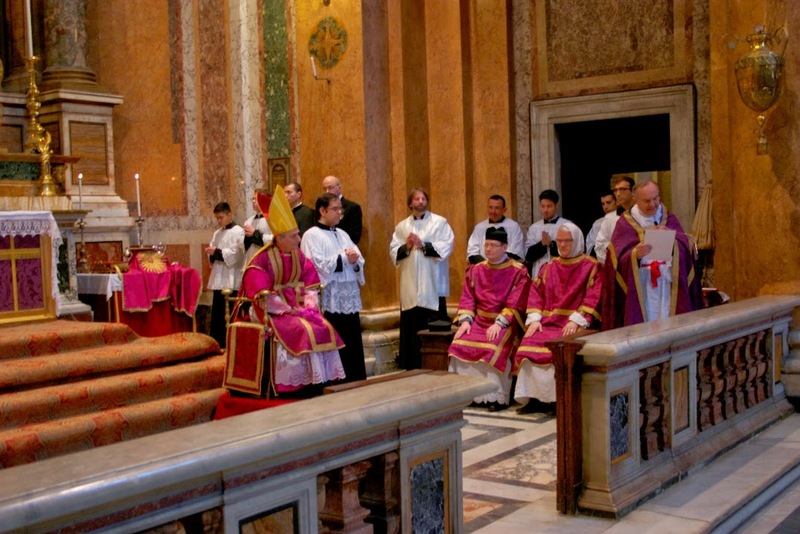 The Institute of Catholic Culture is organising its annual Laetare Sunday Vespers service coming up this weekend. The event consists of Solemn Vespers and Benediction of the Most Holy Sacrament and will be led by Fr. Paul Scalia, accompanied by Chorus Sine Nomine. 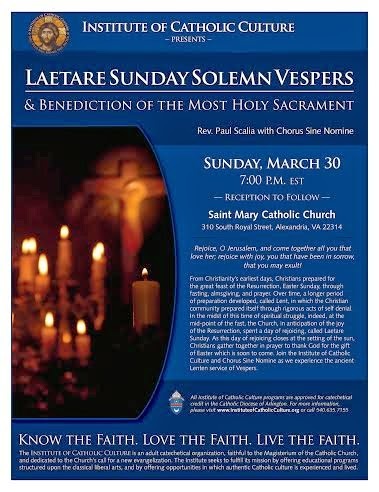 It is scheduled for Sunday, March 30th at 7:00PM at St. Mary’s Catholic Church in Alexandria, VA. It will be in the Extraordinary Form. The Institute of Catholic Culture is doing a lot of good work to promote the reestablishment of a Catholic Culture and to my mind has it just right. It is a local organisation with an international reach. 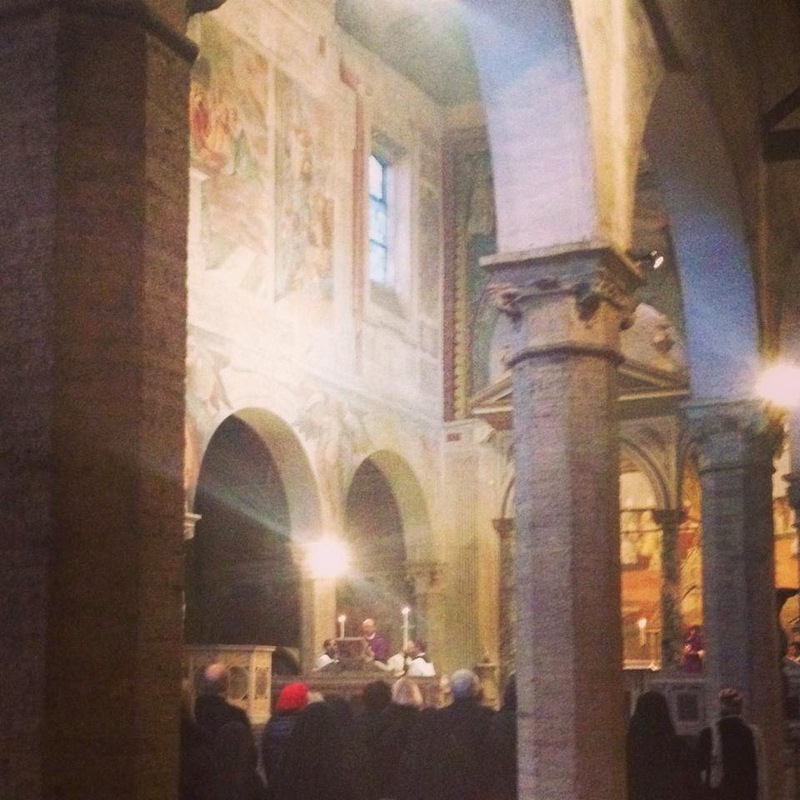 They understand fully the importance of the liturgy to the culture. I wrote about the organisation at great length here.